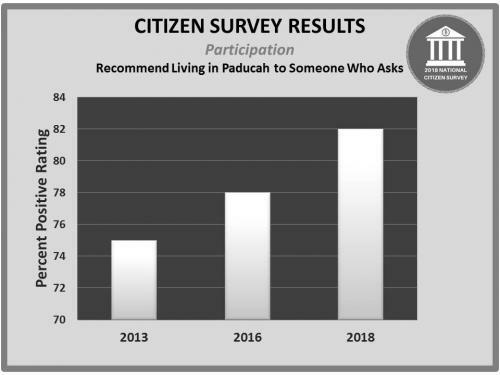 The City of Paducah has received the results from the National Citizen Survey that was mailed earlier this year to 1500 randomly-selected households within the Paducah city limits. The survey asks questions about a community’s livability which includes city services, civic participation, governance, and various community characteristics. 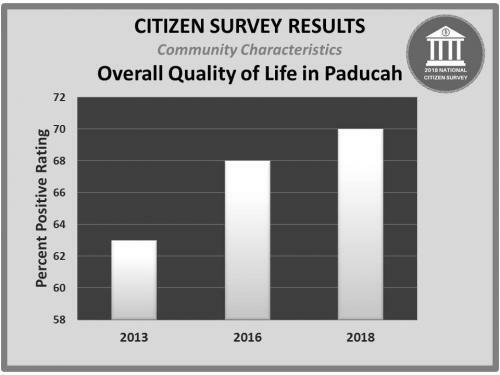 The percent of positive responses for the question asking about the overall quality of life in Paducah jumped from 63% positive in 2013 to 68% positive in 2016 and to 70% positive in 2018. Regarding Paducah as a place to retire, the percent of positive ratings increased from 63% in 2013 to 65% in 2016 with a significant jump to 74% in 2018. A couple of other questions with noteworthy increases focused on governance and participation. 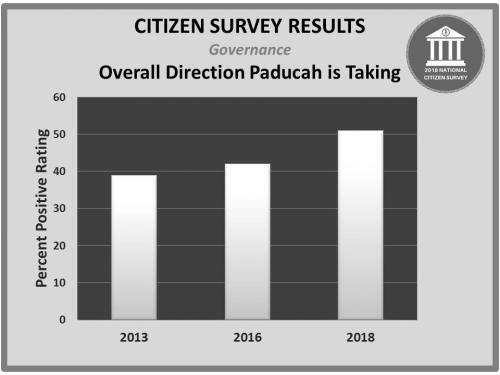 When asked to rate the overall direction that Paducah is taking, the positive responses increased from 39% in 2013 to 42% in 2016 and to 51% in 2018. Regarding the question about how likely you would recommend living in Paducah to someone who asks, the positive responses increased from 75% in 2013 to 78% in 2016 and to 82% in 2018. The National Citizen Survey gathers feedback from citizens about the three pillars of a community: Community Characteristics, Governance, and Participation. The pillars are further divided into eight facets: Safety, Mobility, Natural Environment, Built Environment, Economy, Recreation & Wellness, Education & Enrichment, and Community Engagement. Each question on the survey is connected to a pillar and facet. Pre-notification postcards were mailed to the 1500 randomly selected Paducah households with the first mailing of the survey sent the week of May 7. A second mailing of the survey occurred in the middle of May. Individual answers are anonymous. Paducah received the finalized reports in August. The survey instrument and compiled statistical survey results are below. 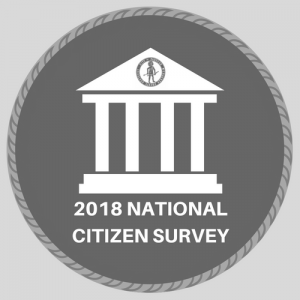 The City of Paducah worked with the National Research Center, Inc. (NRC) in 2018 to administer the National Citizen Survey to gather feedback from citizens about city services, civic participation, characteristics of Paducah, and various community topics. The International City/County Management Association (ICMA) and the NRC developed the survey. The multiple-choice survey measures a community’s livability by asking questions about eight facets: safety, mobility, natural environment, the built environment, economy, recreation and wellness, education and enrichment, and community engagement. 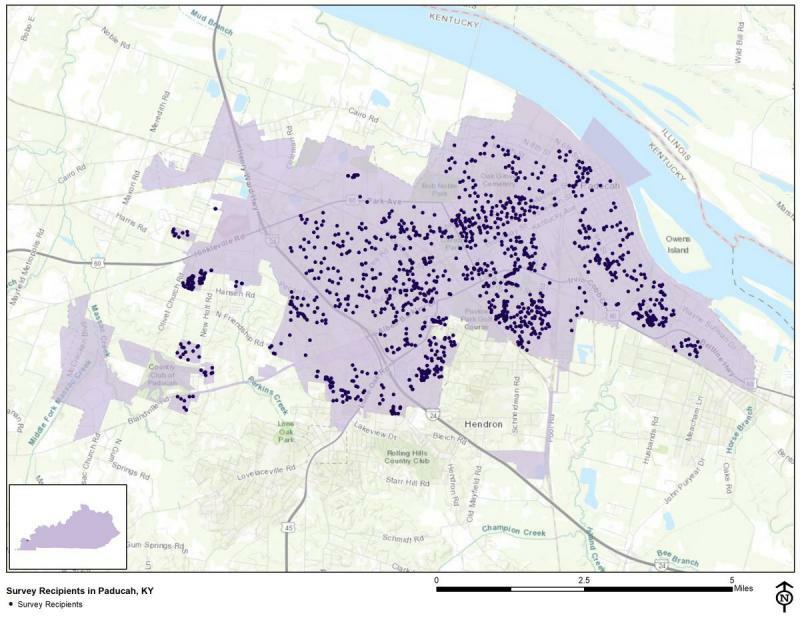 The process involved the mailing in May of surveys to 1500 randomly-selected Paducah households (see map) with a new feature offered by the NRC this year, an opt-in web survey to collect additional community responses. Community members who did not receive a mailed survey were encouraged to complete the survey online until June 20. Once a household received the survey, the adult in the household who most recently had a birthday was asked to complete it. This is an unbiased way of selecting the survey participant allowing the results to be representative of the community. There are five pages of questions asking citizens to rate various city services and community livability topics. Citizens are asked to respond to questions including what is their overall feeling of safety in Paducah, how often they do certain activities such as attend a local public meeting or visit a neighborhood park, and how do they feel about Paducah as a place to live, work, and visit. The majority of the survey is standard so that cities can benchmark and compare their results directly to other cities. However, each city that uses the survey is allowed nearly a page of customized questions. For this survey, Paducah asked custom questions relating to storm water, sidewalks, and the importance of specific neighborhood qualities and features. If you have a question, contact Public Information Officer Pam Spencer or 270-444-8669.